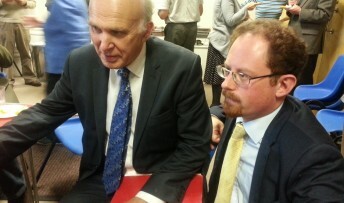 Business Secretary, Vince Cable will be welcomed to the city by MP Julian Huppert next month when he comes to launch Cambridge Business Week. Vince will be in Cambridge on Monday, March 18 when he will meet business leaders and the finalists who are hoping for success in the business awards categories. Business Week recognises entrepreneurship and business in Cambridge and the event will attract speakers and delegates from across the UK. Next he will travel to ARM in Cherry Hinton where he will meet senior executives and hear how the company has just launched a campaign to fill a million technical jobs by 2016. From there he will go on to Cambridge Computer Lab – the highest rated computer science department in the country – which has helped 200 university spin out and start-up companies. The department is celebrating its 75th anniversary this year. Vince will also be visiting RealVNC – the only double winners of Queen’s Awards for Enterprise in 2011 – and law firm Mills and Reeve, which has just moved into Botanic House on Hills Road. Julian said: “I am delighted Vince is coming to Cambridge to launch this hugely important event. “We have a dynamic business community in Cambridge carrying out some ground-breaking work; Business Week is an opportunity to showcase that work and recognise the excellent achievements that are taking place there.